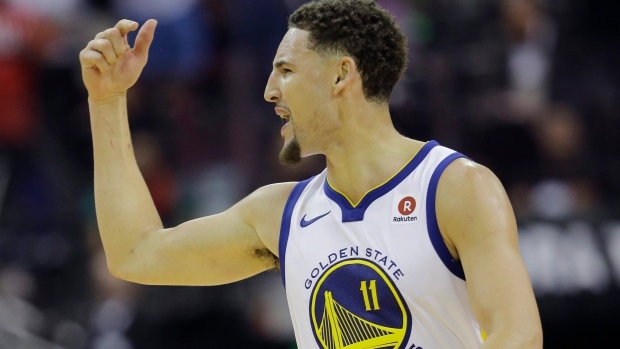 Jack Armstrong returns with his thoughts on the Golden State Warriors' efficiency, the Houston Rockets' offence, sports betting, and more. 1. WARRIORS’ EFFICIENCY: Golden State turned in an impressive road performance against the Rockets on Monday night. The Warriors dropped 119 points on Houston, shooting 52 per cent from the field and 39.3 per cent from three-point range while racking up 24 assists. It was a really polished and unflappable showing by the defending champs. 2. ROCKETS’ OFFENCE: Houston is a fun team that scores a lot of points but they’re guardable because they have so little off-ball movement in their offence to occupy the defence. The Warriors have a good number of plus defenders and lots of length that can guard on the ball, in passing lanes and challenge shots consistently. James Harden had 41 points Monday night, but he’s going to have to get more of his teammates involved to open things up a bit to create easier shots for everyone. 3. CAVS’ SHOOTING: When Kevin Love, J.R. Smith, George Hill and Kyle Korver shoot a combined 3-14 from distance in Game 1 against Boston to go along with LeBron James’ lousy 0-5 from deep you’ve got serious problems. Spacing, ball movement and shot selection are critical for a team built on this style of play. 4. CELTICS’ DEFENSIVE EFFORT: Boston looks locked in and ready to go. The Celtics had good energy and attention to detail in Game 1, holding the Cavs to an amazing 83 points on 36 per cent shooting. I doubt that will happen again in this series, but Boston’s length, quickness and athleticism are not an easy nut to crack. They grind you down and make you play ugly. Just ask all their opponents this past season. The Celtics get after it and make you earn everything. 5. SPORTS BETTING (U.S.): We already see it in Canada and Europe and now the U.S. is getting in the act with a major Supreme Court decision Monday. It remains to be seen how it will all play out state by state but I’m sure the four professional sports leagues and their teams will come up with ways to monetize this big time. Money talks and it just spoke. There will be interesting developments ahead.